Please read our latest post Do the Right Thing which appears in the July 27 edition of The Southampton Press as a Letter to the Editor. Steve Wisnoski was just self-appointed to the Westhampton Free Library’s private governing club–ahem, board of trustees. Three teachers, three attorneys, one insurance agent. Friends appoint friends and spend your tax dollars. The WH Library is taxpayer funded with over $4 million cash in the bank and an over $3 million annual operating budget–and the self-appointed trustees will not change the bylaws (based on an 1897 charter) to allow for trustee elections. Budget Vote Results: The Westhampton Free Library budget passed 360-185. The school budget passed as well, 448-99. Thank you to those who voted no to the library budget because they agreed that taxation without representation is wrong, $4 million cash already in the bank was enough, and we don’t need to renovate our new building. Maybe next year the budget put forth by self-appointed trustees will be defeated. Please click our News tab above for more information. Plans are well underway to re-design the first floor interior space and expand the attic of our 7-year-old building (opened June 2010). Maybe people will say “enough.” It’s already a brand new library. Let the Town of Southampton build us a community center with those tax dollars of ours it collects. The Town building on Mill Road by the 7-11 is an abandoned eyesore. Or have the Village build another parking lot. We’re double/triple taxed. Seven unelected Library trustees alone should not decide how to spend our money. The expansion/renovation project will not be put out for a public ballot vote because it doesn’t have to be, unlike the WHB High School turf and lights, for example. The Library is a “private corporation” based on the 1897 Charter, yet now funded by millions of tax dollars. And why is there such a large surplus of money in the Library’s coffers ? We believe many people may not be informed, and that’s unfortunate. Public Design Charrettes were held on January 11 and February 15, 2017–months when no one is here–regarding the renovation of the attic using Ann Skovek’s $1.3 million donation. The next charrette was to discuss the REDESIGN OF THE LIBRARY’S FIRST FLOOR on April 12–during the school district’s spring break. Does the Library actually want public input? I attended the January and February meetings. Everything is basically all decided. Perhaps the taxpaying patrons will get to vote on the paint colors. The Westhampton Free Library is an association library that still maintains a self-appointed, unelected trustee board. Only 6 of 19 Suffolk County association libraries still cling to this governing structure though it’s undemocratic and un-American to have zero elections at a taxpayer-funded institution. Just because it’s legal doesn’t make it right. No more taxation without representation. NYS legislators need to step in and put an end to self-appointments at taxpayer funded association libraries. Contrast the upcoming Westhampton Free Library expansion & renovation on a brand new building with The Sag Harbor Library’s Expansion that was Led by an Elected Board, Community Leaders and Residents. 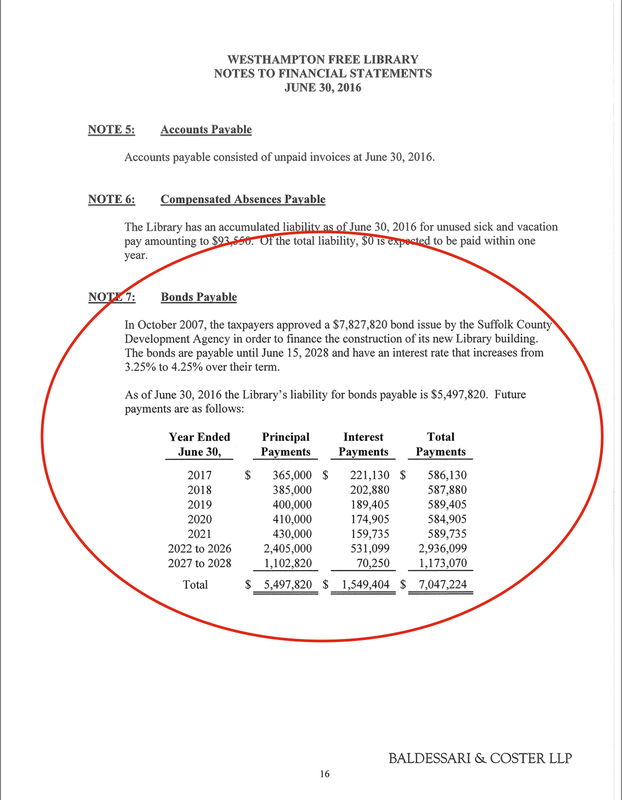 Below is a detail from the June 2016 Westhampton Free Library Audit. 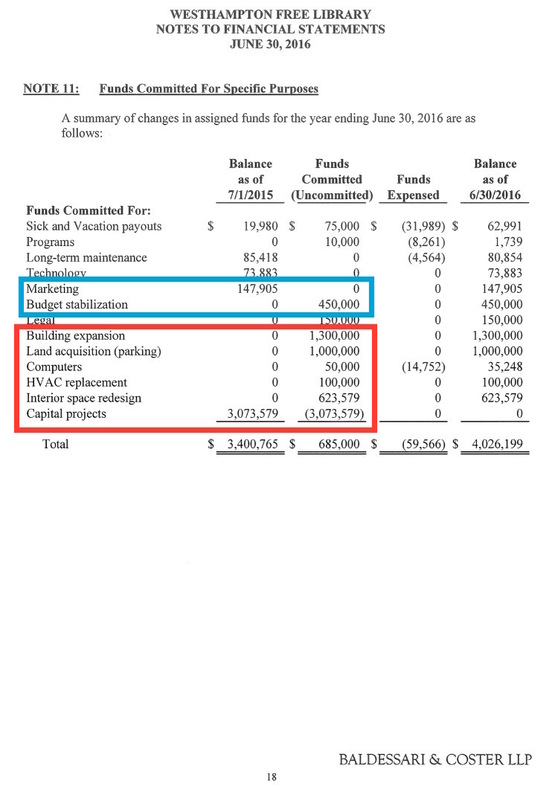 Notice the accumulation of TAX DOLLARS over and above Ms. Skovek’s donation to be used for capital projects. Self-appointed trustees selected these projects; the projects do not go out for a community vote, like school district turf and lights, for example. An elected official does not appoint our Library trustees; they appoint each other, that’s why it’s a private, closed club. Please read The Joke is on Your Hard-Earned Dollars as well as a copy of my recent Letter to the Editor, published in The Southampton Press, 1/12/17, Clinging to Power. Also, The Library’s Slush Fund and Voting Members of the Association Explained. Quick question: Why not use the $1.3 Skovek donation to pay down the outstanding building bond instead of renovating our 7 year old building? If there’s a pre-payment penalty prior to June 2018 (something mentioned about that in the February board meeting), save the money to pay the bond next year then. Six self-appointed trustees alone run the show. They alone decide who may join their private Library governing club. They alone earmarked millions of our tax dollars for a parking lot, renovations on the first floor of a new building, a new HVAC system, budget stabilization, etc. There are no trustee elections and no community capital project votes. In the 4/13/17 edition of The Press, Phil Keith says in his editorial “Are Libraries Obsolete?“: “I do agree that the public should have some say in who sits on the board governing any and all community libraries. Publicly elected boards, are, in fact, more common than appointed or volunteer boards.” Yes!! Further affirmation of our mission! See our post for more information. This Viewpoint piece, written by a wise, intelligent and prominent community member and copied in its entirety from the November 19, 2015, edition of The Southampton Press, is still relevant today. Please read other posts by clicking the News tab above. The Board of Appointed Trustees of the Westhampton Free Library is not allowing taxpayers to join the association. The six appointed trustees are the only “members” of our association library (Voting Members of the Association Explained). Please keep this in mind when the Library starts renovating the 7-year-old building. 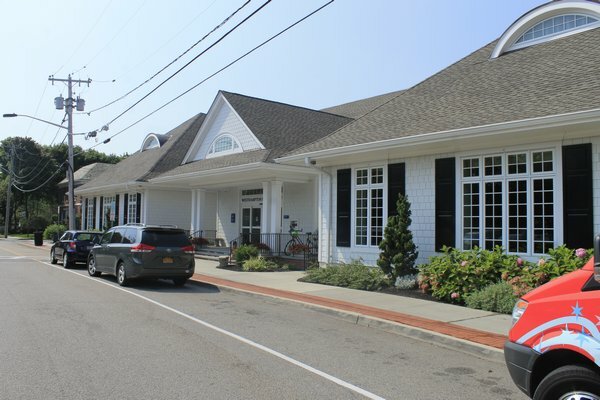 We are a group of citizens working to establish a taxpayer-elected Board of Trustees for the Westhampton Free Library in Westhampton Beach, New York. Join us Wednesday, August 16 at 7 pm for the Westhampton Free Library board meeting. Note: Only 29% of Long Island association libraries still have self-appointed boards of trustees. Appointed isn’t American for taxpayer-funded institutions. Thousands of taxpayers fund the library with multi-millions of dollars yet just six appointed trustees will select which individual is deemed worthy to serve on the board along with them. If you’re interested in serving on the Library’s board, please submit a trustee application. The form is short and quick to complete. You can also pick one up at the library’s front circulation desk. Library taxpayers are denied their right to vote even though the NYS Department of Education says the public may vote for trustees. The WHF Library’s Board of Appointed Trustees spent your tax dollars to deny you your right to vote. What civil service and prevailing wage issues have plagued any of these Long Island association libraries with elected boards, some for decades, Appointed President Moore? None. Why isn’t that in your 14 page Report of the Selection of Trustees? Also, if the bay is polluted, possibly by too much sewage, why do we want the Library to be granted special exception/exemption sewer credits? Weren’t there reasons that the Library was only allowed to be built a certain size just 7 years ago? Why might our Village spend tens of millions of dollars on a sewer district–again, to perhaps help with the polluted bay–yet the Library can be granted sewer exceptions? Perhaps Appointed Library President Husband Tom Moore should get on the same page as Elected Village Mayor Wife Maria Moore. The Library’s Slush Fund, Our Community Center, Over $3 Million to be Spent Renovating/Expanding Our Brand New Library, and Voting Members of the Association Explained. 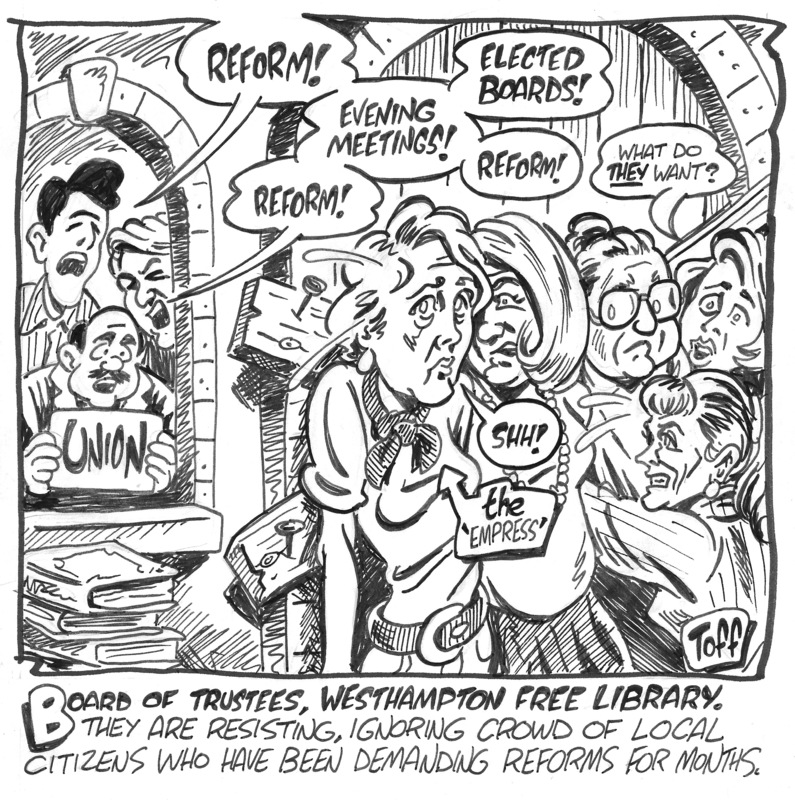 The Board of Self-Appointed Trustees of the Westhampton Free Library didn’t spend our tax dollars asking a top tier labor attorney (Zuckerman letter) to prove the successes for decades of the majority 13 association libraries in Suffolk County with elected boards. Or of other association libraries on Long Island and in NYS with elected boards and unions. The Port Jefferson Free Library, for example, unionized in June 1987 and moved to an elected board of trustees in 1990. The South Country Library in Bellport in the 1950s extended the library association to include all the residents of the South Country School District. Rogers Memorial Library in Southampton allowed for trustee elections in 1996. The Shelter Island Public Library allowed for trustee elections in 2011. We could go on. The Board used your hard-earned tax dollars to hire a labor attorney to set out to “prove” that they must retain complete and absolute power and remain self-selected. The trustees cherry-picked bits of information to show that an elected Board of Trustees “could,” “conceivably,” “maybe,” “possibly,” somehow one day harm the Westhampton Free Library. Guess what? I could maybe, possibly, perhaps, conceivably one day get into an accident if I get into my car, but I still get into my car. The Board used your tax dollars to deny you your right to vote. We believe the self-appointed Board of Trustees of the Westhampton Free Library was deceitful in preparing their Report on the Selection of Trustees. The pivotal April 13, 2016, Board Meeting: Instead of a mature, public discussion about elected vs. appointed boards at the April meeting or, even better, an open and welcoming invitation to taxpayers to attend a town hall meeting about elected vs. appointed boards publicized on the Library’s website and in The Press, the Board of Appointed Trustees of the Westhampton Free Library, by decree and with obfuscation, instead presented a rebuke of the right to vote that was stunning in its scope and magnitude. 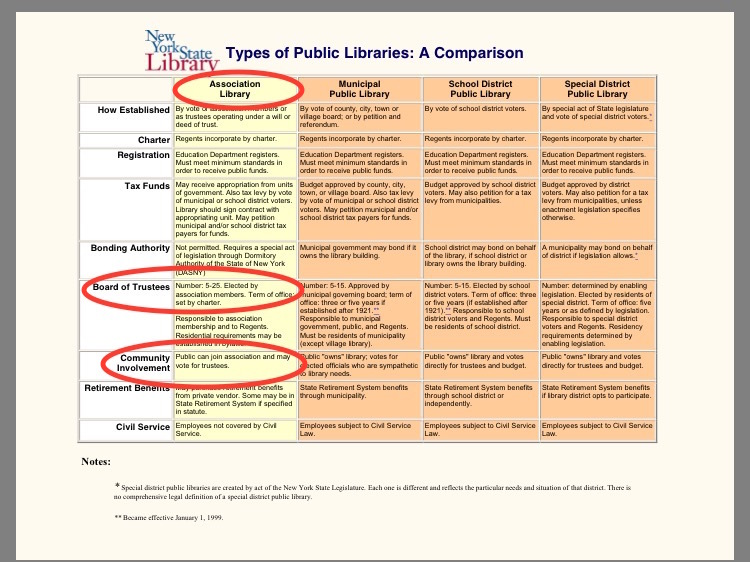 In addition, the NYS Department of Education provides a model for how an association library can retain its “private” status yet allow for trustee elections. It is a simple amendment to the bylaws. The union is a completely separate issue and can operate successfully with an elected board of trustees. It is already being done in many other libraries. Here are the Library’s Executive Summary and the Report on Selection of Trustees. Click to sign our online petition. This is our library, our community and our money. We elect our school boards and our Village trustees. We should elect our Library Board. I agree 100% with this. The library should be the intellectual capital of Westhampton Beach and surrounding towns.